I was a Campfire girl. We didn’t sell cookies. We sold almond roca and mints. And it wasn’t a very big deal. We walked the neighborhood, called grandma and sold at the local grocery store. To be fair, I don’t think Girl Scout cookies were a great big thing in the 80s either. Teresa is a Gold Award Scout. That’s the Girl Scout equivalent of an Eagle Scout. Over the last 15 years, I have bought my fair share of cookies from her. Cookies were always a big thing for her, but I just assumed she was good at selling them, and probably the exception, not the rule. The last month—our first foray into Girl Scout cookie selling—has disabused me of that notion. Every single movie parody, stand up routine and Saturday Night Live send up of the Girl Scouts is deserved. Maybe not where the girls are concerned, but I promise you that the adult Girl Scout world is a virtual Jonestown and you better drink the koolaide. Did you know that participating in a Cookie Program helps build self-esteem? Learning that you can set a goal, budget for your needs, create a marketing plan and then go and make it happen teaches our girls to believe in themselves better than any “self-help” training. Doesn’t that sound like a creepy recruiting pitch for selling timeshares in the Caribbean? When you couple this with the understanding that only $.70 of each $4 box goes back to the troop or scout and that our leaders were required to commit to a certain number of cases before ordering started, that little blurb is pretty impressive spin for what is a massive fundraising campaign for the organization. GSA gets $2.08 per box. If you can’t see it, these are the guidelines on Whistleblowing and Divorces. Third party whistleblowing is not acceptable, along with anonymous whistleblowing. If you are going to call out your five year old neighbor for doing a walk-about after the walk-about sale window has closed, you better be ready to give your full name. I’ve tried for three weeks, but cannot begin to imagine a situation where a border treaty seemed like the only, best, last solution. I’m running a huge risk by writing this. It says very clearly in the Adult Code of Conduct—which both Shea and I had to sign—that willful creation of discord is a violation. Uh-oh. Because I haven’t even said what I really want to say. How on earth can an organization which claims to want the best for their scouts, including physical health, sell these things, which are pure crap??? Tons of calories, sugar, palm oil and unpronounceable ingredients. The Thin Mints and Peanut Butter Patties are vegan. How can that be when they are covered in chocolate, I wondered. Turns out, chocolate comes from a bean. That’s vegan. The higher the percentage of chocolate, the more pure it is. And how about the math of it all? If a young lady sells 1250 boxes of cookies, she qualifies for a Google Chromebook. She’s earned her troop $875. She’s earned GSA $2575. She’s earned herself $400 in Cookie Dough that she can apply towards Girl Scout trips and costs. The troop and GSA take-away from this child’s efforts is $3050. A Google Chromebook retails for $199. Maybe these details are the man behind the curtain when we’re talking about building self-esteem “better than any self-help training”. Two weeks ago, I got called in to help pick up our cookies because I have a Tahoe. I drove to our local semi-pro baseball stadium where I was directed by a woman wearing a tutu to park in the holding lot. I joined two of our troop leaders in their big cars. At our appointed time, we lined up our cars to drive through the parking lot. At this point I was kind of out of words because we were following behind a U-Haul that someone rented to pick up their cookies. 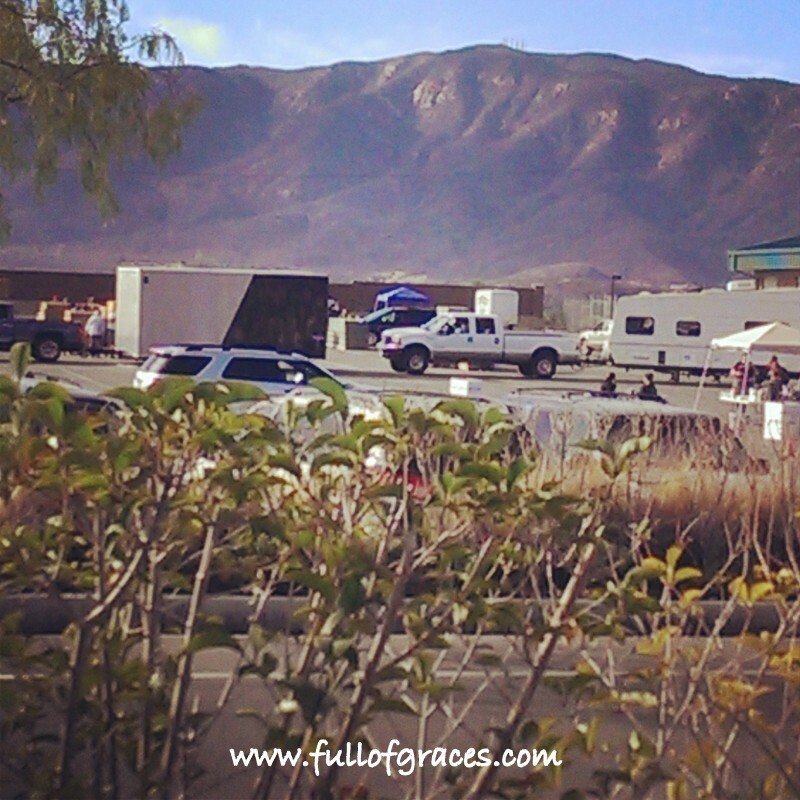 Across the parking lot, I could see toy haulers and horse trailers. I was told not to get out of my car at any time for any reason once I entered the cookie line, where soccer moms and dads wearing tutus were loading boxes of cookies and grooving to Taylor Swift. When our leader hit the front of the line, the lady with the clipboard laughed. Threw her head back and laughed. Our troop leader, who I love and who I know will never drink the Koolaide, waved me off with a roll of the eyes and a smile. I knew what she was thinking: Now we’re that troop. *I’m not saying that I didn’t eat a whole box of Thin Mints all by myself. I’m just saying it was bad for me. NEVER would have participated if I had a girl child. I’m not fond of ANYONE telling me what to do! On the other hand, at least you KNOW where all of the money is going and what the ingredients are in the cookies. Not sure if I’ve downed koolaid or not yet, but I do see what it’s done for my 6 year old. She is SO confident and SO proud to be a girl scout! She has goals and is ready and willing to work hard to achieve them. I think back to how shy I was when I was her age (I wouldn’t even order from a snack bar by myself in 8th grade) and think I would have benefitted from having to approach people to buy cookies. I know the cookie booklet is kinda overboard, but at least there is organization and there are rules so everyone knows what they are. Girl Scouts is so much better than my son’s travel ball baseball league that is totally unorganized and ran by one man who makes last minute decisions based on his own needs. True enough. I just wish they weren’t so serious about such an awful product. Girl Scout cookies and Valentine’s Day candy don’t count. Do they really wear tutus???? Would I lie about something like that? Lol. I don’t know where you’re getting your figures from but GSUSA does not receive any of the money from local cookie sales. Frankly, you should know that since it is in that training guide. I know because that guide pictured is my councils training booklet. I’m appalled that you think it’s okay to twist the facts around just to get readers to your blog. The scout program does a lot for girls. If you don’t appreciate all the good that comes from the cookie program then don’t participate! Stephanie, I got my figures from a page called “this is how the cookie crumbles” which states exactly the numbers I listed here and is distributed by the GSA. And clearly says that $2 goes to GSA. 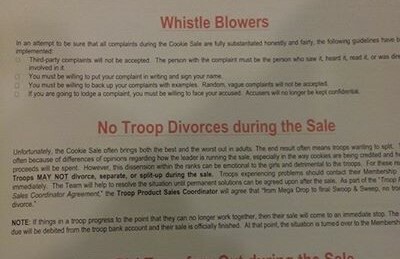 The bottom line is, the cookies cost $1 and the troop gets $.70. The rest goes somewhere my friend. I used the info provided to us by GSA. As for not participating, we surely will not next year. Instead we will write a check for our share of boxes multiplied times $.70 and give it to the girls, which is where it belongs. I would love to see you post a picture of that page since I have the exact same booklet and that is definitely NOT what it says. It wasn’t in the book. It was a seperate page provided by GSA. Clearly you are full of it. The national organization you are referring to is G.S. U.S.A. not GSA first of all. Second, the book you have previously posted pics from had the correct information in it which you clearly omitted because it didn’t back up you opinion. The chart in the book clearly shows that council properties&girl programming receive $1.61 per box, council properties $0.47 per box, troop proceeds $0.70 per box, girl rewards $0.22 per box and the bakers cost $0.99 per box. All cookie money stays within the council that earns it. National only receives money from the bakers use of the copyright. Also, I think it shows a lack of integrity to sign a contract on conduct and then break it, publicize that you broke it and laugh about it. Ok. So I didn’t specify that national doesnt get it. My whole point was that the TROOP doesn’t get it. And I didn’t break a contract. I called out some truth, which is that selling unhealthy food where the sellers see less than a quarter of the profits is a racket, and to package it as anything else…especially a self esteem program…is disingenuous and unethical. And…your numbers prove my point. $2 to GSA per box. Now…I wonder how much the council employees make? They are buying cookies! If I’m looking for something healthy I buy produce not desserts. Your argument is ridiculous. Clearly you have some sort of bias for whatever reason. Just remember that you are taking away from little girls who are learning valuable skills (and supporting their communities through community service) with every person you convince. I’ve seen girls too shy to speak come out of their shells with this program. An autistic girl reach top seller and walk out on stage in front of thousands after participating. There are a lot of worthwhile causes to rally for or against in the world. I just don’t see how this qualifies as one. The $2.01 stays local in the council. Clearly you didn’t get that. It does not leave the council, the direct area it was earned in. GSUSA does not receive the funds. I said that it you would read my comment! You stated in your blog post that you were breaking the contract. Are you even paying attention? I won’t bother pointing out anymore flaws in your argument since it’s obvious the truth and facts are not important to you. I wish you the best, however I hope you can focus your attention on things deserving of criticism. Everyone has a right to their opinion, but altering the facts to serve your agenda is not an opinion, it’s just negligent. The facts are that council “makes” .48 a box. That is how bills are paid, salaries are paid etc… So lets do the whole break down to help you out with facts. The box costs $4 to the customer, of that $.99 goes to the baker. the troop gets .70 base proceeds – that is not including the PPP bonuses paid out or the higher proceeds for troops who opt out for $1 troop proceeds. $.22 is for rewards plus cost of cookie dough which can pay for travel, camp, high school needs like cap and gown, Letterman jackets, ACT and SAT tests prom tickets and college applications. 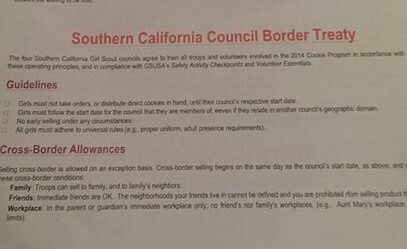 $1.61 pays for adult programming, membership, support services, financial aid, camper-ships, buildings properties camps, regional funds, ppp bonus funds, additional opt outs etc… so where you are breaking it down to GSA is pocketing huge bank off the cookies is ludicrous at best. You break down that one reward, the Google chrome, as only costing so much money, but everything we do is cumulative. So in actuality a girl earning the Google Chrome level will have that awarded at a bbq awards ceremony for her and her parents, plus she is earning the $400 cookie dough card, the Cali girl excursion to Universal for 2, the scooter or mp3 the 2 movie tickets, the Glow party and Walk about (if earned) the plush and all the patches. Plus if her troop hit the PGA levels, also a Back pack and the CEO brunch. While rewards are NOT what the program is about – they certainly aren’t being poorly rewarded as you imply. The program has 5 skills that we teach, the first being business ethics – Because ethics are such an important part of the program we have rules built in, not because the girls need it but to keep the adults ethical. That is why there is a border treaty between 4 neighboring councils that is why we have codes of conduct about whistle blowing – because if you have a problem with something you should be able to put your name behind it not just anonymously complain. Rules are put in place always because of previous years occurrences and those rules grow due to behavior. Not because anyone likes having to tell people how to behave. You clearly are unhappy with the program. You are welcome to your opinion. You are welcome to not participate. You are even welcome to come to the town hall meetings every summer to help mold the next seasons sale if you would like. But try to stick to the facts when blogging. The cookie program does help raise our children to have greater self esteem it does help our children to become “employable teens” and it does create an atmosphere for teaching basic life skills we all need as adults- planning, budgeting, banking, cash handling, customer service, marketing, ethics and above all people skills. If you’re not happy don’t participate or better yet come forward and help be a part of the planning process we always welcome any incite, ideas or better ways. Look, you are also welcome to your opinion and free to not read the blog. But I just have to say to both of you that you aren’t disagreeing with me. You are making my point. According to your math $2 goes back to GSA. Which is exactly what I said in the post. And now that I have survived my first cookie sale I can tell you that girls are not selling cookies and that’s only the first delusion. Parents and grandparents and older brothers and sisters are selling the cookies. And no wonder when a little girl gets a gun pointed at her on a walk about. The whole point of the post is that GSA takes itself a little too seriously.